Very happy as not many come up for grabs over this way, will need a coat of paint but would look something all chromed as well. What's the history on it? Is it Ferguson? Don't see markings. What is the GM in middle of wrench? 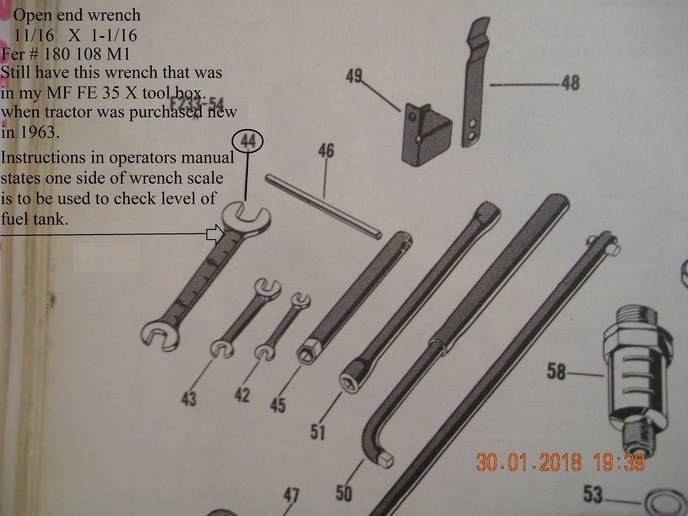 The marking on the wrench is it "CM" as in Centimetre's" ? 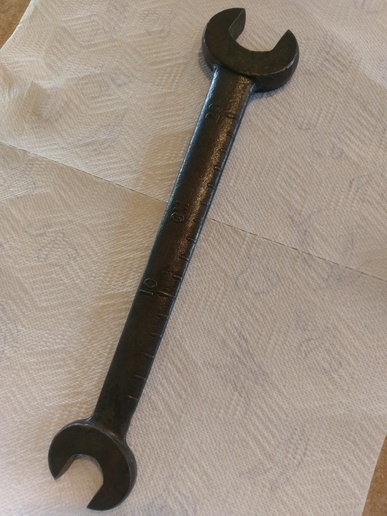 I'm wintering away from our summer home so am not able to verify the marking on the wrench. John Deere Bob...???? Where is your winter home? The high mountains of BC? Up where the crisp morning air will clear the cob webs outta yer lungs as you carry firewood inside.... every 20 minutes... agh what a life in the north country !! Closest town Is Dawson Creek BC....22 miles from our home. Actually the border between Alberta & BC divided our property. I believe you have family in Whitecourt , Sherwood park? What is number 48 in the picture? I have one on my T035 and have no clue what it does (or holds)? Hi yes, on one side it has the markings 3 and 6 with gradients between on the other side it has 10, CM and 26 with gradients in between. What year did these appear what were the markings on the earlier ones. Hoping John Deere can tell us. In the states we have wrenches with Ferguson---MHF--and Ford with inches on the wrench. They were used for adjusting plows--measuring fuel--depth of plowing. 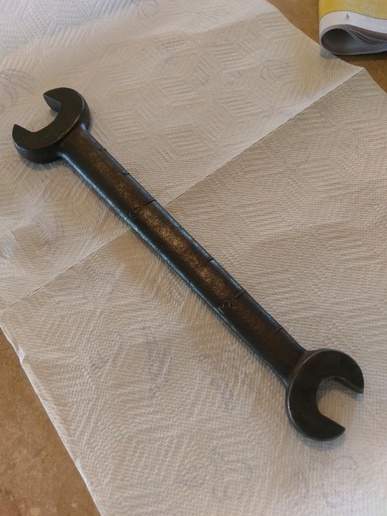 Some called them plow wrench and other's called it a gas wrench. I've seen them used for a hammer. I've got several in tool collection. Now with the above said, my TEA-20 has TWO clips that resemble Item 48. attached to the right hand fender. These clips hold my spare KNIFE for the Dearborn 3 point hitch mower. Any wrench can be used for a hammer when it's not being used to round off the points on the heads of threaded fasteners. Thanks for the info"graham_in_NJ "